South Australia’s capital will charm you with its pleasant temperature, massive wine region, trendy bars and cool culture. There are gorgeous beaches too, and with the population being just over one million, plenty of surf and sand to go ‘round! The 19th century cathedrals around town certainly give the city character, but there’s so much more to uncover in “the city of churches”. 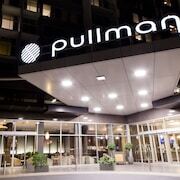 Book some of our Adelaide accommodation and banish the thought of Adelaide being boring FOREVER. A trip to the Adelaide Hills wine region is a lofty goal for your Adelaide visit, and the Mount Lofty Ranges are where it’s at! Find your new fave Sauv Blanc or Pinot Noir among more than 48 cellar doors and vineyards, some with sweeping views over lakes, vine-covered hills and other fine scenery. If the wine doesn’t entice you, the restaurants, art galleries and natural beauty just may. 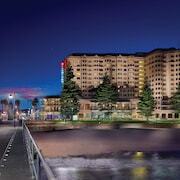 Hop on a FREE tram ride to the seaside village Glenelg. This superb suburb has heritage hotels, the shops of Mosely Square and – most importantly – the beach, where you can sunbake, swim with dolphins or stand on the jetty and watch the sunset. In the heart of the city, Adelaide Botanic Garden is a relaxing green getaway with 125 acres to explore, and glasshouses with rare plants. Adelaide Zoo is home to more animals than Noah’s Ark. You can explore eight hectares of gardens, meet and greet the Chilean flamingo and the Bolivian squirrel monkey, and help a zookeeper feed some hungry hungry hippos. A 50-minute drive out of town, Monarto Zoo is the world’s biggest open-range zoo and a place where you can see lions, cheetahs, giraffes and a whole crew of other African animals roaming around the plain. If you’d prefer to go to church, or at least admire one, there are plenty of choices there as well. Got shopping on your mind? 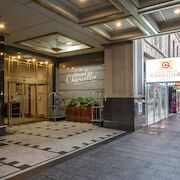 Work your credit card at Rundle Mall, which has three big department stalls and over 700 more choices, or Burnside Village, which offers upmarket fashion in the chillaxed suburb of Glenside. Adelaide has fashion boutiques and stores stocking local designers around the city, so you won’t have to go far to get something unique and chic. If you like your meals to come with a little bit of everything from all over the world, Adelaide’s dining will delight. There are restaurants owned by celebrity chefs, casual Asian food on Gouger Street, beachside cafes at Glenelg and, of course, meals in the Hills made from super-fresh local ingredients. After dark, dress in your best and pay a visit to a laneway bar, a retro cocktail lounge, a boutique nightclub or a bar with rockin’ live music. Ready to sip, swim, party, relax or unwind in Adelaide? 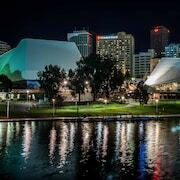 Bundle up your cheap flight to Adelaide and Adelaide hotel with us and you’ll see why the locals call it “Radelaide”. Wander the halls, gardens and boulevards of one of Australia’s oldest universities and find plenty of fascinating stories on your educational visit. Visit one of the largest stadiums in Australia to see an international test cricket match, a home-team AFL showdown or fascinating sporting exhibitions. In the centre of Adelaide’s CBD, this large city square is where you will find some of the most important buildings in the state, including many historic sites. See how roses are tested for Australia’s climate while you return to nature in these historic gardens. This uniquely striking monument, set among Adelaide’s city parklands, tells of a young nation shocked by the terrible realities of war. Enjoy a wine-centric experience at this world-renowned winery: Learn tasting tips, tour historic vineyards, discover the winemaking process and taste delectable gourmet food. Learn about Antarctic explorers, conduct your own research and see a squid in an elevator shaft at this natural history museum. Treat your taste buds to the distinctive flavor of McLaren Vale wines at this elegant winery and its cellar door housed within a 19th-century ironstone chapel. Escape the noise and bustling crowds of Adelaide’s city shopping precinct with a picnic at these traditional Japanese gardens. One of Adelaide’s most important churches features stunning stained-glass windows, beautiful surroundings and a resident choir that has captured hearts worldwide. Experience magnificent McLaren Vale flavors paired with fresh seasonal dishes when you take a seat on the veranda of this family-owned winery. Climb aboard historic ships, see antique nautical instruments and hear of tales of Australia’s past dependence on the vast seas. Discover the icons of Australian motoring at this museum, research facility and collection of vintage cars and futuristic vehicles in the Adelaide Hills. See what life was like for Australians in colonial times at this historic mansion-turned-museum. Discover the cultures that have helped shape the state and hear the stories of its people at the first Australian museum of its kind. How ‘bout a road trip? We’ll head to a place with rolling hills, national parks, charming villages and all the wine you can drink. The special charm of the Barossa Valley can be tasted in the wines crafted on this estate. Enjoy tasting the produce while overlooking the winery’s native gardens. Meander through the historic gardens of the oldest family-owned winery in Australia and discover elegant and nuanced wines from one of the country’s award-winning vineyards. The tiles exiting and entering the bathroom were extremely slippery. Breakfast was very ordinary. I love that the reception send you a text to make sure you are happy with everything. We were given an upgrade on arrival which was fantastic too!